Max-Fire® Ultra-Spark® performance spark plug wires are manufactured from highest quality materials to help deliver maximum voltage – ensuring the ultimate performance. These wires have an extremely high EMI/RFI suppression along with a very low resistance to help deliver the most spark possible. They feature a heavy duty 8.5mm diameter silicone jacket to protect the Kevlar spiral wound core from heat, moisture and chemicals. 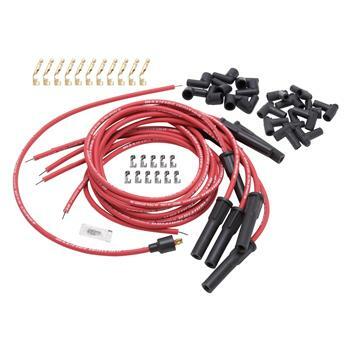 Max-Fire offers two levels of spark plug wires; Ultra-Spark 500 and Ultra-Spark 50. Ultra-Spark 500 is a great choice for replacing OEM wires and are value priced. They feature high quality leads that deliver 500 ohms of EMI/RFI noise suppression with low resistance. They are ideal for daily drivers and for budget builds, offering the best combination of value and performance. Ultra-Spark 50 spark plug wires are engineered for high performance engines that need all of the voltage they can get for maximum power output. They are made with wire leads that deliver a low 50 ohms of resistance per-foot for maximum EMI/RFI noise suppression. This makes them ideal for engines with aftermarket high performance upgrades that require maximum voltage.